When you have a baby you will quickly see how fast that first year goes by. And babies change so much in just one month! 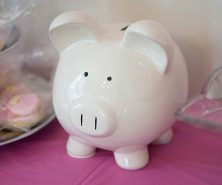 We love the idea of taking a photo every month to see the difference month-by-month. And to make it easy to identify how old your baby is in each photo, you can use baby month stickers. You can find a lot of options in baby stores or even online (see the bottom of this post for some of our favorites), but you can also easily make your own with these free baby month stickers printable. The tricky part is always trying to get babies to sit still. While we don’t have the magic answer for this, a little trick we have used is to sing or make funny noises. Trying to get them to laugh usually works too. Once you have all of your photos done these would be great to give as a gift for the 1 year birthday party or even to put into your baby’s baby book. You have probably seen these baby month stickers everywhere – and most of you probably thought you had to order them from Etsy! 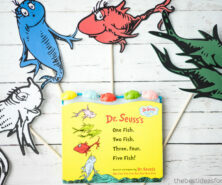 Well you can easily make your own with just a few supplies! for your printer which can easily be used for other things. Or you can print on cardstock and use double-sided tape to get it to stick to your little one’s shirt. Then you simply cut around the shape of the sticker! 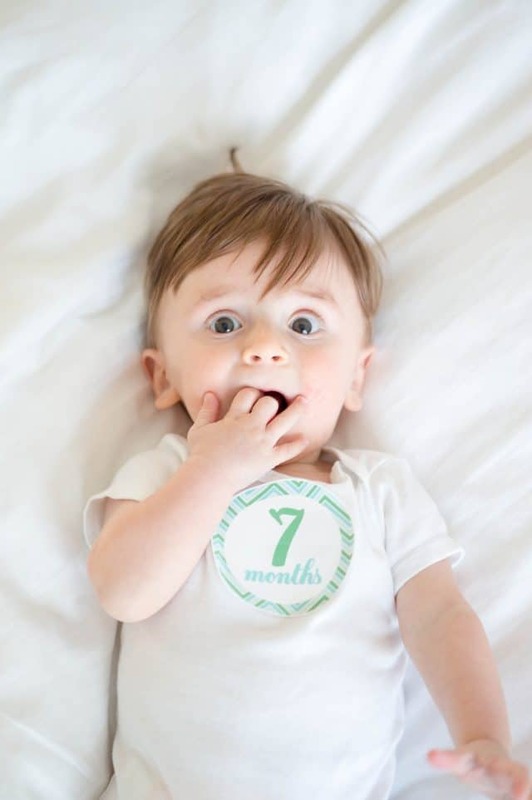 To make the baby monthly stickers pop more, you can put them on a white onesie. Another cute idea is you can put the sticker on something else like inside a small picture frame or on a teddy bear and have that beside baby in the photo. Get the FREE Baby Month Stickers Printable HERE. 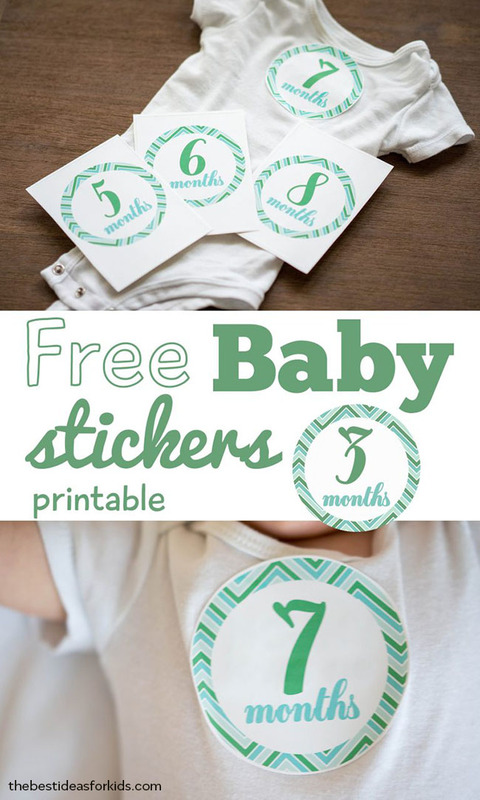 Note – these free baby month stickers printables are for personal use only. 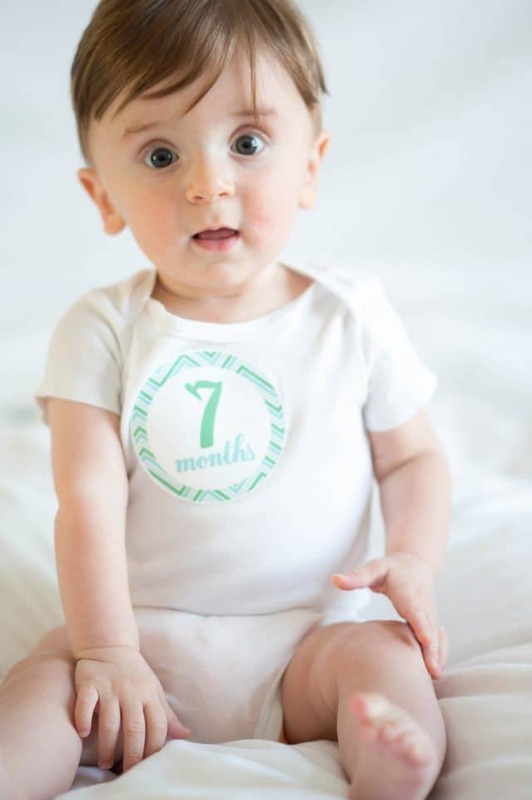 Have you used baby month signs or have you used a different way to take pictures each month? Comment below if you have and if you were able to remember to take them every month! Also don’t forget to review our Best Teething Toys round-up. You’re going to want to see this list to help soothe those sore baby gums! If you’re struggling with sleep, we also have a comprehensive article on 5 ways to help your baby sleep through the night. It’s been pinned over 15,000 times by other parents who love the advice! I took a picture of grandson each month in the rocking chair in his room and then I scrapbooked the page. It’s so cool to see how big he got each month. I’m going to use these stickers this time for my granddaughter. Saw them just in time as she’s 1 month on Friday. That’s a great idea Carolyn! My friend just had her triplets and I am giving these to her in a welcome home basket! Thank you! That’s great Olga! So glad you’re able to use them and for triplets no less! Thanks for sharing! This are so cute! For baby #2 definitely ! Glad you like them Bianca! Thanks for stopping by! I had already pinned these, but just wanted to comment and let you know how CUTE they are and how excited I am to use them for baby boy after he arrives in January! 🙂 Thank you! Oh awesome, thanks so much Heather! And congrats on the baby! These are super cute and wish I would have had them in the first 12 month’s of my little man’s life! Thanks for sharing. Thanks Jennifer! Maybe for the next one? 😉 thanks for stopping by! Super cute idea for photos as they grow. I remember taking pics of my little ones (now 4 and 7) each month, love those photos. 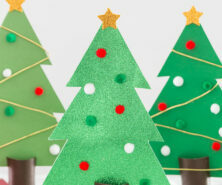 These are perfect to use, pinning! Thanks Heather. Yes it’s so much fun to watch them grow each month as they change so quickly! Thanks for pinning! Thanks Kim – so glad you like them and thank you for pinning!